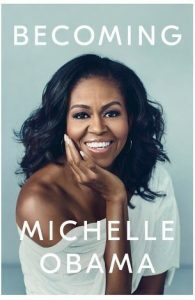 Is Michelle Obama’s Book Cover An In Your Face Message? By Ed Heinzelman On November 15, 2018 · 1 Comment · In Bigotry, Idiocy/Lunacy, Insanity, Those Kooky Conservatives! Do you think that Michelle Obama’s choice of dress for the cover of her book Becoming is an in your face taunt of some of her detractors? Don’t know what I am referring to? Check HERE! One Response to Is Michelle Obama’s Book Cover An In Your Face Message? No, she’s just being her lovely self. If she wanted to get ‘in your face’ to her detractors, she would have done a double whammy and been photographed in a beautifully tailored, elegantly proportioned… tan suit.